This old handcraft knits past with present. Just as Knight’s works have returned, so has the textile trend: Not since the international fiber art sensation in the 1960s and ’70s has woven textile artwork been in such high demand—or had such wide-ranging appeal. Alongside the reemergence of midcentury-modern architecture and the worldly eclectic aesthetic, woven textiles are making a comeback in a more contemporary way—in new forms that champion organic spontaneity. Other modern artists are joining the abstract movement with fresh spins on the three-dimensional, layered woven yarn and jute tapestries that previously reigned. At The Loveliest, smaller, more vibrant works from artist Marie Matter of Wool & Weave dangle from the shop’s walls. Sourcing small-batch fibers from local yarn shops, Matter blends muted retro hues with cheery grays, pinks, blues, and reds and hand-weaves threads on frame looms before stringing her 20-inch-long pieces from driftwood sourced from the Pacific Northwest. The artist favors color blocking and asymmetry, allowing disproportionate threads of yarn in different hues to suspend freely: “I’m inspired by my surroundings, whether art, movies, travel, or the outdoors.” she says. “I love to start with color themes, which result in pieces that are abstract but warm.” Now that’s what we call well woven. 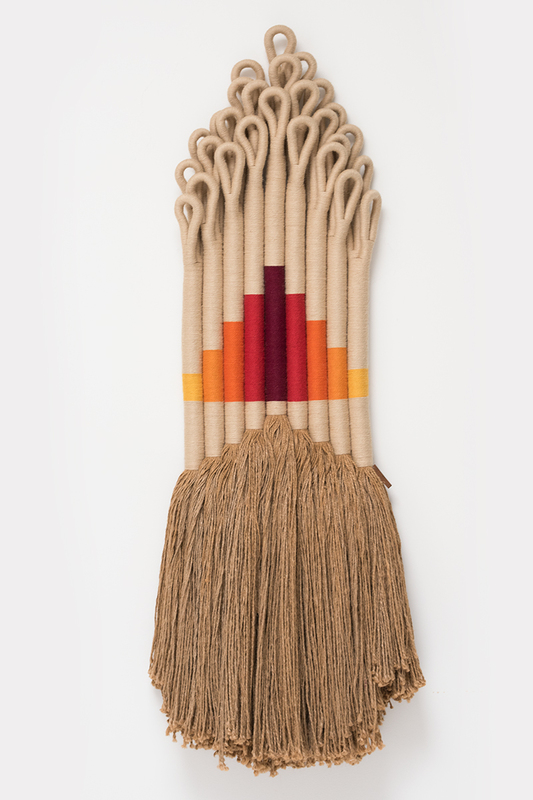 Finland-trained textile artist Elizabeth Anyaa has been hand-fusing filaments including high-quality wool, silk, bamboo, and soy (that source from as far as New Zealand) into massive wall hangings since 2010. She often relies on the fibers’ natural colors for textural dimension, though custom hues can be commissioned. Her works can be found in all three of Dallas’ Osgood O’Neil salons and in prominent private collections. From $750, at elizabethanyaa.com. For rare, fibrous artworks crafted during the original textile uprising, head to 20C Design, which is showing the full exhibition of pieces created by Michigan textile artist Jane Knight. “They look different from every vantage point,” Rucker says. Knight is the real deal: One of her freestanding artworks was up for grabs on 1stdibs.com for $35,000. From $2,600, at 20cdesign.com. Lauren Williams’ textile art company, Boho by Lauren, was born in 2014 out of a need to creatively fill wall space. “I love my children, but to hang another gallery wall of photos—I couldn’t do it,” she laughs. “Wall hangings are individualized and one of a kind.” Williams’ wall hangings have reached up to six feet wide and seven feet tall often include dyes made from diluted paint. From $450, at bohobylauren.com.